Does that idea intrigue or repel you? If intrigue is your answer, you’ll want to read on. That was my response to the recipe I found in Renee Erickson’s new cookbook: A Boat, A Whale and a Walrus. Even though I had been baking and cooking almost every day during my winter break and thought I was ready for a few days off before I returned to my busy classroom, I couldn’t stop thinking about this recipe after I found it. It’s unique combination of pepper, mustard, 4 shots of espresso, ginger and molasses haunted me. I was just so curious about what it would taste like that I finally had to bake it the last night of my vacation, Sunday night. And I was so committed to it, that even after I got home from a birthday party at 7:00, walked the dog and figured out I could just get it baked before my bedtime of 10:00 only to discover that I was out of dried ginger and would have to go to the store if this cake was to happen, I still carried on. The Bundt pan had, after all, already been buttered and floured. It was worth the later than planned bedtime. And I was able to share it with my neighbors and my cake loving coworkers, so the holiday feeling lingered on. It has a unique depth of flavor that warms the winter days and it keeps really well. The piece in the photo sat out for a day and was a week old by the time I got the photo taken and it was still moist! -Preheat oven to 325 degrees F. Carefully butter and flour a Bundt pan and set aside. -In a medium bowl, whisk together the flour, baking soda, salt ginger, cinnamon, mustard, and black pepper to blend. -In the work bowl of a stand mixer fitted with the paddle attachment, cream the butter and sugar together on medium speed for 1 minute, until light. Now, here she says to add the eggs, molasses, and espresso mixture, and mix again on low speed until blended and that a few small lumps are okay. I found that things didn’t blend well at all and I ended up pulling the bowl off my mix stand and using a whisk to try and incorporate the hundreds of little lumps I had. I carried on and it turned out fine, but you may try adding the items above one at a time to see if things blend in a bit better. Next, add the flour mixture and mix on low speed or use a whisk and beat just until the flour is completely incorporated. -Transfer the batter to the prepared Bundt pan and bake for 50-60 minutes, or until the cake is puffed and a skewer inserted into the center comes out squeaky clean. Cool the cake in the pan for 10 minutes, then invert it onto a cooling rack set over a baking sheet and let it cool. -While the cake bakes, make the candied orange peel and orange syrup glaze: First, halve and juice the oranges, then strain the juice into a liquid measuring cup. Carefully cut the pith from the oranges, saving just the orange part of the peel. (I found it easiest to use a paring knife to cut off strips of peel and then scrape the remaining pith off. You want to get as much pith off as possible because it can make things bitter.) Slice the peel into 1/4 strips, transfer them to a small saucepan, and add water to cover. Bring the mixture to a boil, boil the peel for 5 minutes, then drain the water. Add fresh water to the reserved orange juice to make 1 cup of liquid, then add the liquid and the sugar to the pan with the poached orange peel. Return the peel to the heat and cook at a low boil for about 10 minutes, or until the peels are very shiny and almost translucent. Transfer the slices to a piece of parchment paper to dry and reserve the syrup for glazing the cake. -Serve the cake slightly warm or at room temperature, sliced, with the candied orange peel and freshly whipped cream. I also tried it with crème fraiche and it was a delicious compliment. I also ate it plain and didn’t miss a thing. Enjoy! 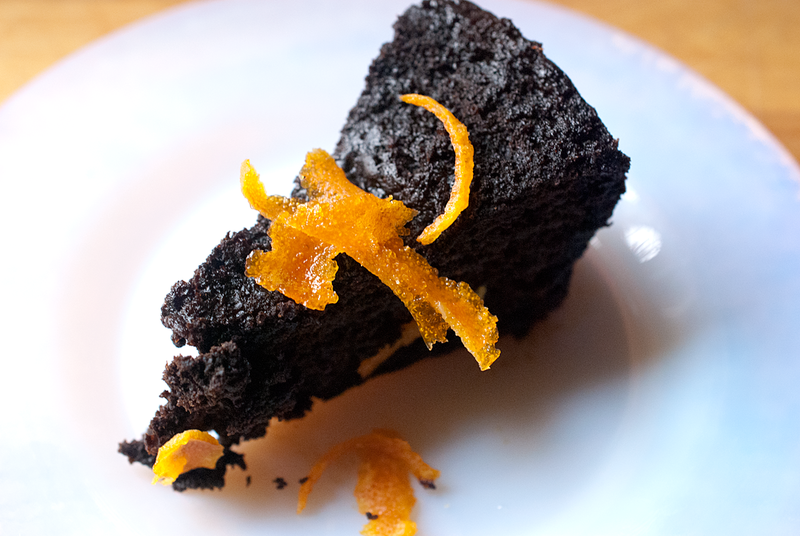 This entry was posted in desserts, Posts and tagged cake, dessert, espresso, ginger, molasses, spice.